President Donald Trump waits to welcome Dutch Prime Minister Mark Rutte to the West Wing of the White House in Washington, Monday, July 2, 2018. Trump, July 1: If you look at what has happened with farms. Over 15 years, it’s just a steady decline. Over the last five — I’ve been here a year-and-a-half — over the last five years, they have been very bad years for farms and farmers. I said, we have to change that. And one of the reasons is because they have barriers. These aren’t even economic barriers, although, in Canada’s case, 275 percent tariff for dairy. That’s not fair. Trump is wrong that farm income has been in “steady decline” over 15 years and generally right that the last few years have been “very bad” — but not for the reason he gives. U.S. farms “experienced a golden period during 2011 through 2014 due to strong commodity prices and robust agricultural exports,” according to a February report by the nonpartisan Congressional Research Service. Since then, however, net farm income has been well below those record levels — a trend that will continue through fiscal 2018, the CRS report says. The U.S. Department of Agriculture’s Economic Research Service forecasts national net farm income at $59.5 billion in 2018, down nearly 7 percent from last year and “substantially below the 10-year average of $85.7 billion,” the CRS report says. 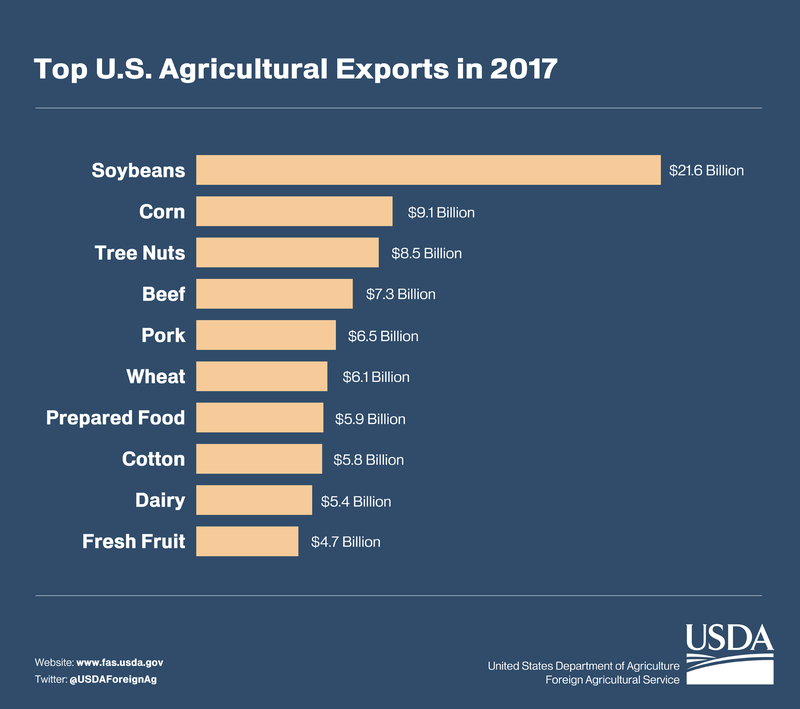 As for trade, the USDA reported in November 2017 that farm exports “totaled $140.5 billion in fiscal year (FY) 2017, climbing nearly $10.9 billion from the previous year to the third-highest level on record.” That’s an increase of 8.4 percent. “As it has done for well over 50 years, the U.S. agricultural sector once again posted an annual trade surplus, which reached $21.3 billion, up almost 30 percent from last year’s $16.6 billion,” the USDA said. 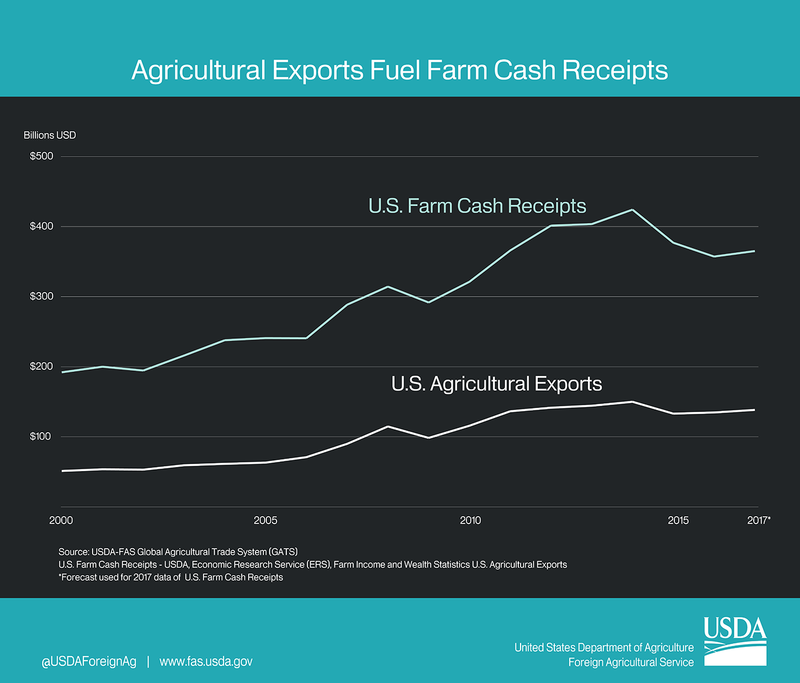 This USDA chart shows how farm exports have fueled farm cash receipts since 2000. Trump is generally correct about Canada’s high tariffs on U.S. dairy imports. Canada limits U.S. dairy products that can be imported without tariffs and imposes stiff tariffs above those quotas. “Under the current system, U.S. imports above quota levels are subject to high tariffs (e.g., 245 percent for cheese, 298 percent for butter),” according to Export.Gov, a project of the U.S. Department of Commerce. But that’s the exception — not the rule — when it comes to trade with Canada under the North American Free Trade Agreement. “Canada eliminated tariffs on all industrial and most agricultural products imported from the United States under the terms of NAFTA,” with dairy and poultry being the exceptions, according to Export.Gov. Tyner, the Purdue professor, said it is not unusual for countries to impose trade barriers on what he called the “white trade,” which he said is rice, dairy, sugar and cotton. Despite Canada’s high tariffs on dairy, the USDA says that U.S. dairy exports grew 17 percent to $5.3 billion in fiscal 2017 from the previous year. Tyner co-authored an article with a Purdue colleague, Farzad Taheripour, on the potential impact of China’s retaliatory tariffs — focusing in particular on the No. 1 agricultural export, soybeans. Contrary to Trump’s claim, Tyner said that trade has not been a problem for the U.S. agriculture sector — until now. 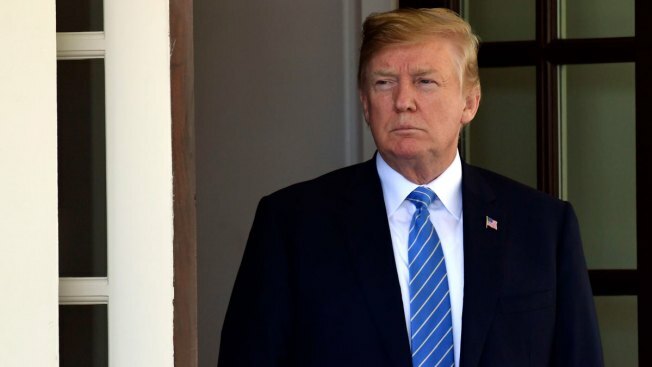 “For the president or anyone else to say trade is a problem – it is now, but wasn’t a month ago,” he said, referring to the retaliatory tariffs.